Located in the far north of the country, Chobe National Park is Botswana's third largest and most visited national park. It takes its name from the Chobe River, which flows along the park's northern boundary and forms the border between Botswana and Namibia's Caprivi Strip. The river is the region's heartbeat, providing a year-round source of water for the multitude of animals and birds that call the park home. Its fertile floodplains combine with the grasslands, mopane woodland and thick scrub in other areas of the park to create a patchwork of habitats that together provide shelter for one of the greatest concentrations of game on the African continent. The land now protected by Chobe National Park was historically inhabited by San bushmen, or Basarwa: nomadic hunter-gatherers whose rock paintings can still be seen at various locations throughout the park. Chobe Game Reserve was established to protect local wildlife and promote tourism in 1960, and seven years later the area was declared as Botswana's first national park. Today, the park can be divided into several distinct sections. In the north, the Chobe Riverfront (also known as the Serondela area) comprises the park's iconic floodplains and mopane forests. This is the most accessible and most visited region of the park, and also boasts the highest concentration of wildlife. In the park's northwest corner, the Linyanti Marshes provide ample hunting grounds for Chobe's predators; while the remote Savuti region can be either arid or lush depending on water levels in the Savuti Channel. 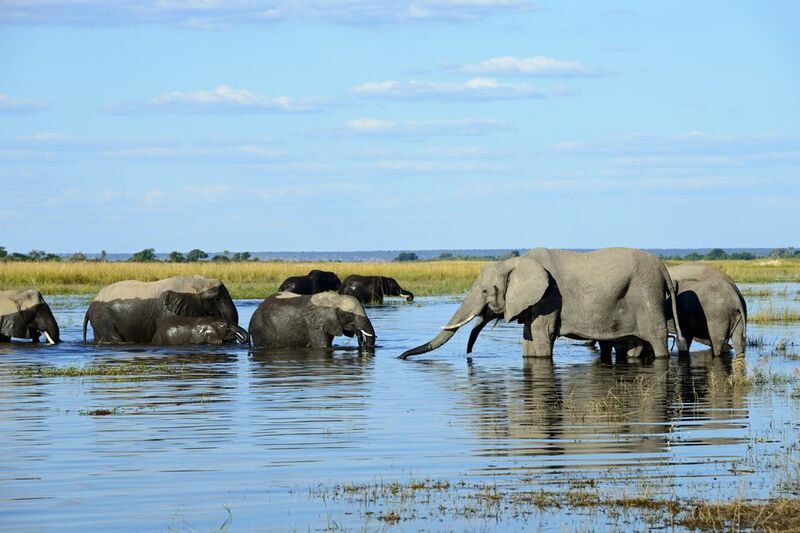 Chobe National Park is renowned for its huge elephant herds, many of which number hundreds of individuals. In total, it is estimated that there are around 120,000 elephants living within the park's boundaries. Buffalo are equally numerous, and the park is also famous for its healthy population of lions. It is possible to see the Big Five here, although rhino are increasingly difficult to find. The Chobe River constitutes the ideal habitat for water-dependent animals including hippos, Nile crocodiles, waterbuck and the near-threatened red lechwe antelope. Other Chobe highlights include puku antelope, leopard, cheetah and the endangered African wild dog. Chobe National Park is also a hotspot for birders, with over 450 recorded species. It has the highest density in Southern Africa of many raptor species, including the bateleur eagle and the vulnerable lappet-faced vulture. The near-threatened African skimmer is a top spot along the river; while the banks of the Chobe are studded with the burrows of the magnificent Southern carmine bee-eater. Other notable species include the kori bustard (Africa's largest flying bird), the Pel's fishing owl and the pallid harrier, a near-threatened Palearctic migrant. Game-viewing is obviously the number one activity for visitors to Chobe National Park, and there are many different ways to do it. Many people opt for a conventional jeep safari organized through a safari lodge or tour operator. Accompanied by a knowledgeable guide, safaris like these are a great way to benefit from insider information about the best places to see specific animals. The most rewarding game drives take place in the early morning and late afternoon, while a night drive is the only way to see Chobe's fascinating nocturnal wildlife. Many lodges also offer walking safaris and river cruises. The former afford the opportunity to experience the bush up close and personal; while the latter are a Chobe specialty designed to let you observe the wildlife that congregates at the water's edge to drink. Self-drive safaris are another possibility, and a great option for those on a budget, or anyone that relishes the freedom of deciding their own itinerary. Chobe has three excellent public campsites, making it possible to spend longer stretches of time exploring the park without having to stay in one of the more upmarket lodges. Although there are many lodges nearby, Chobe Game Lodge is the only permanent accommodation located within the park itself. A five-star eco-lodge, it is romantically situated on the banks of the Chobe River and offers 44 guest rooms. Each one boasts air-conditioning, an ensuite bathroom and a private terrace with stunning river views. Four decadent suites add to the experience with their own infinity plunge pools. Those in search of something a little more rustic should book accommodation at one of the park's private tented camps, or at the Ihaha, Savuti or Linyanti public campsites. The latter should be booked well in advance. For a truly unique safari experience, consider staying aboard one of the houseboats that ply the Zambezi and Chobe rivers. Luxury charters like the Pangolin Voyager and Ichobezi Houseboat give you a temporary home on the water and ringside seats to the wildlife action along the riverbanks. The dry season (May to October) is conventionally regarded as the best time to visit Chobe National Park. The days are sunny, warm and dry; while the nights can get chilly. The roads are easily navigable for safari vehicles and self-drive cars alike, and mosquitoes are at a minimum. Best of all, the lack of available water elsewhere in the park encourages animals to stay around the river, making it easy to spot a huge variety of wildlife in a short period of time. However, there are benefits to traveling in the hot, humid wet season, including spectacular birding, fewer tourists and cheaper accommodation rates. The easiest way to get to Chobe National Park is to book a domestic flight to Kasane Airport (BBK), located just outside Kasane town and the northern entrance to the park. Other nearby airports include Victoria Falls Airport (VFA) in Zimbabwe; and Harry Mwanga Nkumbula International Airport (LVI) in Zambia. From all three airports, you can drive to the park yourself or arrange a transfer with your chosen lodge or safari operator.